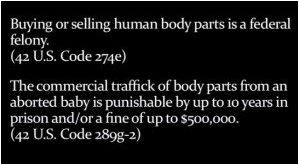 ABORTIONIST HAVE A VIVID IMAGINATIONS WHEN IT COMES TO JUSTIFYING THEIR WORK - FOR MONEY! 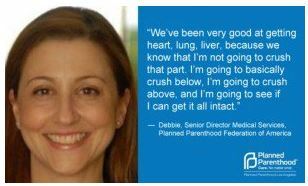 Nucatola has worked for Planned Parenthood since February 2005, ascending to the role of senior director in 2009. She got her BA from the University of Wisconsin-Madison and her medical degree from the State University of New York Downstate Medical Center College of Medicine. "Unborn babies aren't human, but their organs are". How does that make sense? Evil - pure evil! Cecile Richards, President and CEO of Planned Parenthood will tell you a baby is not a human being until it is out of the womb. Richards is the daughter of former Texas Governor Ann Richards and was a former deputy chief of staff to Nancy Pelosi, the Democratic Leader in the House of Representatives. Her husband , Kirk Adams, is labor organizer for SEIU. This one who had been at her trade for 23 years feels her work "abortion"
was for the good of the baby - a living, breathing baby! 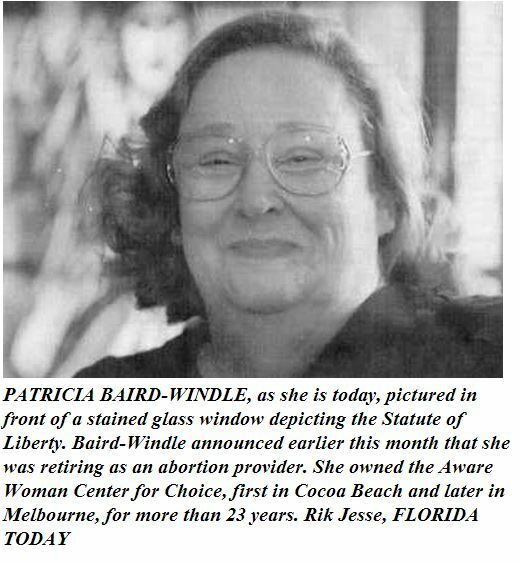 For over past 23 years, Patricia Baird-Windle maintained a local, state and national profile as one of the stalwarts on the front lines of the abortion wars. Patricia Baird-Windle once said that abortion was part of her religion.